Jaguar's F-Type is a bold exercise in building the perfect sports car. The range of V6 and V8 powerplants suit the chassis perfectly, making it a serious performance machine to compete with the likes of the Porsche Boxster, BMW Z4 and the Audi TTS. The F-Type also gives V8-equipped competitors such as the Corvette and Mercedes SLK55 AMG a serious run for their money as well. The Jaguar F-Type recalls the legendary 1960s E-Type and is a driver's car to its core. While its 2-seat configuration may lack a certain amount of interior space, the F-Type more than makes up for it with "pace" and "grace," long-time hallmarks of the Jaguar nameplate. The F-Type features an aggressive front end with air intakes and side vents, with two distinct design elements Jaguar calls "heartlines — he styling starting points in the F-Type's shape that highlight the car's front fenders and rear haunches. Beyond that, the F-Type wears elegant aluminum sheet metal available in one of 13 colors. A 3-layer power soft top with Thinsulate provides thermal and acoustic insulation in convertible models. It is available in four different colors, including black, gray, red and beige. Jaguar states that its soft top opens and closes in just 12 seconds. Additionally, seven different wheels ranging from 18 to 20 inches are available. F-Type coupes and convertibles each come in one of five different trims. The base F-Type is powered by a turbocharged 2.0L 4-cylinder engine that produces 296 horsepower, with a 340-horsepower supercharged V6 optional. Jaguar claims the four banger will propel the F-type to 60 mph in just 5.4 seconds, with a 155-mph top speed. It is mated to an 8-speed automatic transmission. The F-Type R-Dynamic carries the same supercharged V6, but tuned to produce 380 horsepower and 339 pound-feet of torque. Meanwhile, in the F-Type 400 Sport that engine makes an even 400 horsepower. The R trim gets a lot of oomph from a 5.0L supercharged V8 that produces 550 horsepower and 502 pound-feet of torque, and the top SVR trim goes one step further with the V8, making 575 horsepower. The F-Type is rich with features, including LED headlights with LED daytime running lights, automatic climate control, ambient lighting in Jaguar Phosphor Blue and sport seating in leather and Suedecloth with 6-way manual and electric adjustment, though some trims include 14-way power adjustment and full leather Performance seats. Configurable multi-color ambient lighting is available. The cockpit also features a distinct division between driver and passenger, with a prominent grab handle on the center console and even distinct trim materials on either side. Analog instruments are complemented by a 5-inch screen mounted between the speedometer and tachometer and a 3-spoke leather steering wheel features multi-function controls for the audio system and cruise control. A 770-watt Meridian sound system with 12 speakers is standard audio system, while an 8-inch haptic touchscreen provides controls for the infotainment system. A host of options and packages make the F-Type nearly endlessly configurable and allow buyers to spec their new Jaguars to suit their specific tastes. The most popular include the Performance Pack, which adds Configurable Dynamic Mode to adjust engine mapping, steering feel and gearshift response, while the Premium Pack ups the luxury and technology inside the F-Type, with dual climate control and heated seats and steering wheel. Carbon ceramic brakes offer larger rotors and bigger calipers to increase braking performance. The Vision Pack adds safety features including a blind spot monitor, adaptive headlights, parking sensors and a back-up camera. 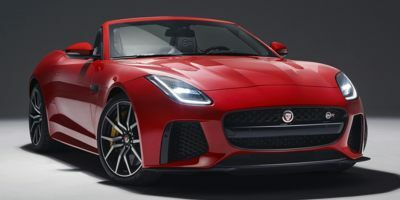 The Jaguar F-type gets a couple of minor additions for the 2019 model year. The biggest change is to the infotainment system which now offers a larger touchscreen with an improved interface, making navigation easier and more intuitive. Also new for 2019 are several standard driving aids such as automatic braking and a Lane Keep Assist program, which should make driving the F-Type easier and safer.